The FD-100 represents an all-in-one product encompassing the latest technology at an affordable price point. Connect it to your dial-up telephone line and you'll enjoy fast and accurate processing. Connect it to your IP line to leverage your IP service and thus not interrupt your voice lines for transactions. 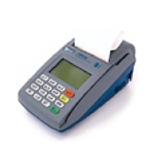 Accepts PIN-secured and signature debit cards, credit cards (including American Express® and Diners Club®), contactless payments, gift cards, and checks using TeleCheck® ECA® or paper solutions plus loyalty programs (such as WEX and Voyager).